Roark went to see the picture. It was still Vesta, as he had seen her last. She had lost nothing and learned nothing. She had not learned the proper camera angles, she had not learned the correct screen makeup; her mouth was too large, her cheeks too gaunt, her hair uncombed, her movements too jerky and angular. She was like nothing ever seen in a film before, she was a contradiction to all standards, she was awkward, crude, shocking, she was like a breath of fresh air. The studio had expected her to be hated; she was suddenly worshipped by the public. She was not pretty, nor gracious, nor gentle, nor sweet; she played the part of a young girl not as a tubercular flower, but as a steel knife. A reviewer said that she was a cross between a medieval pageboy and a gun moll. She achieved the incredible: she was the first woman who ever allowed herself to make strength attractive on the screen. The fascinating character of Vesta Dunning was edited out of the final version of The Fountainhead. Ayn Rand dispensed with her and perhaps compensated by transferring some of her personality to Dominique Francon, the book’s heroine . Nevertheless, many people, even those who have never heard of Rand, have seen Vesta on the silver screen. The young Katharine Hepburn, who predated The Fountainhead by a few years, fit Rand’s description so perfectly that one could be forgiven for thinking that Rand had modeled Vesta after her. Hepburn would have been 100 today. Kate was the original firebrand, an eccentric who refused to play the Hollywood game. I tend to like her more in her early flops : Christopher Strong, Bringing Up Baby, Stage Door, and Holiday, than in her early hits: The Philadelphia Story, Woman of the Year. I did, of course, like The African Queen enough to have watch it twice in a row. I think that post-1940, Hepburn’s roles, either deliberately or not, became more conformist, less provocative and less interesting. In these films, the female lead starts out as a refreshing contrast to the shy, forlorn, submissive damsel, but towards the end, she is tamed and subordinated to the male character. It is as if RKO and all the big studios abandoned the sense of danger associated with Garbo, Davis, Dietrich and Hepburn and gave in, wholesale, to the easy and accessible charms of Shirley Temple. Most of these films were seen at the behest of my roommate, who got me interested in classic films when we were graduate students in Minneapolis. Every week, we requested a classic film from the public library, sometimes as old as the 1920s and 30s, and watched it on Saturday night. In between watching classics like Ben Hur, The Best Years of our Lives, Dr. Zhivago, The King and I, and Casablanca, we had a Kate Hepburn movie as often as we could. It would be unfair to close this post without referring to the site from which we got our information and our recommendations. We referred extensively (and almost exclusively) to ReelClassics.com, a very large database of classic movies, and actors and actress from the Golden Age of Hollywood. It defies belief that all that information has been compiled by only one person. Elizabeth’s site was a great resource for us, and her recommendations were always spot on. If you want a surprise, try the geeky and often overlooked comedy, The Desk Set, which pits a librarian (Hepburn) against an engineer (Spencer Tracy) in a story about the fear of computers replacing human staff in large enterprises. It is not a very well-known film, but it is a hoot from start to finish. When one reads about Hepburn’s landmark films, everyone talks about The Philadelphia Story, but there is rarely a mention of Long Day’s Journey Into Night (1962), a three-hour film adaptation of Eugene O’Neill’s tragedy of a family coming apart. Kate’s tormented performance as an unhappy mother and morphine addict was probably her best work after 1950. It was the only Hepburn film that I found difficult to watch. I have never really felt drawn to watching classic movies. For some reason, they always strike me as staccato personified, a sequence of jerky motion, jerky dialogue, or both. I always have this gnawing sense, though, that I have handicapped myself by giving into this prejudice. As a side note, I have only in the last year understood why Ayn Rand is the figure she is. I had heard bits and pieces, and for the longest time wasn’t certain if Ayn was a man or a woman. Then, spurred on by a scholarship opportunity, I decided to pick up Atlas Shrugged. I am only about 500 pages into my first Rand book, but I couldn’t find any one of those 500 which failed to evoke awe. Whether the story itself is progressing nicely or not, her craftmanship is wonderful. I’m happy to have found your opening quote to remind me of her before reading that it was she who’d been quoted. Thank you for this post … a plunge into classic films is just what I need right now. I’ve never seen The Desk Set, but the thought of Kate as a librarian is too delicious. Among her many other attributes, she has this ineffable quality; perhaps it’s good old-fashioned gumption. Today that’s been replaced by perkiness, which is not the same thing at all. Daniel, I wonder if the jerkiness that you refer to is related to technological deficiency, or to the way in which the screenplays were constructed. On both counts you would be right. On the whole, classic films were simpler in their subject matter, cleaner (far too clean, actually), more escapist compared to today’s. But that kind of distilled drama and forlorn music and dated comedy sometimes works its own magic. Often, the onus is less on the story and more on the stars, which is probably why the personalities of yesteryear are held in such esteem. About Rand: Yes, she is a very powerful writer. If you are 500 pages into a novel, it is probably Atlas Shrugged. I loved it when I read it about 10 years ago. It is a permanent fixture in my shelf. I think that she is a great novelist and her work makes for compulsive reading, but about her philosophy, I have my doubts. Some of these are related to culture (I didn’t grow up in the US), and some arose from my later reading about Rand’s life. These will probably be elaborated in a post some day. Tai: The Desk Set is decidedly kooky, and a lot of fun if you like movies with a lot of dialogue. Without spoiling the movie, I can tell you that there is a scene in which Sumner (Tracy) tests Bunny’s (Hepburn’s) intelligence by asking her a few questions. It is one of my favorite comic scenes ever. That sort of comedy has all but vanished from cinema today. Tracy is calm in the film, and Kate is a force of nature. The supporting cast, including a huge computer made out of vacuum tubes, is also very entertaining. If you are 500 pages into a novel, it is probably Atlas Shrugged. I loved it when I read it about 10 years ago. It is a permanent fixture in my shelf. You’re right, it’s Atlas Shrugged; and I expect it to occupy as permanent a spot on my bookshelf as it has yours. It’s probably something less than coincidence that her characters share the cleanliness you ascribe to classic film, but I can only imagine that the single volume would’ve needed the space of a trilogy if she had filled their shoes more. It’s because the sense her work taps me gustatorially, probably tangentially if we were to look at the neurophysiology (I imagine that there is some signal bleed and noise between sensory regions of the brain), that having described the writing, the orchestration of rhythm and vocabulary, as “delicious”, seems most fitting. I can appreciate Tai’s sentiments, though I have only a fleeting familiarity with Miss Hepburn. As to Rand’s philosophy, I unfortunately have only what I’ve gleaned from Atlas Shrugged and Wikipedia as reference, but I’m not quite enamored of it. I am curious, though, so I’ll have to read more thoroughly, as time allows. For what it’s worth, I really enjoy your rhythm, vocabulary, and perspective, too. Good show. Thanks for posting that lovely picture of Katherine Hepburn. For those who are interested, the Vesta Dunning excerpt was published in The Early Ayn Rand. I’ve seen only a few of KH’s films, one of which was Bringing Up Baby. I hadn’t realised it was a flop when it first came out – I loved it. Daniel: Thanks very much for the kind words. Valda: Yes, I did read the above passage in The Early Ayn Rand. Thanks for the reminder. My impression was that the chapter with Vesta, and a few short stories by Rand, were only published posthumously, by Leonard Peikoff and/or the Ayn Rand Institute. But, I will put a link to The Early Ayn Rand in the post, so that interested readers could check out the other stories. There was a short story about a kidnapped woman writing letters to her father, which I really liked at the time. Thanks also for the quote from Rand’s letter. I wonder if this was for Vesta, though. The Fountainhead was completed in the early 1940’s, while the letter is from 1936. Probably, the novel was in its draft stage at the time. It is surprising to me as well that Bringing Up Baby flopped, and so did Holiday. I think it was around the time that Hepburn, Garbo and some others were referred to as “box-office poison”. I didn’t mean to imply that Ayn Rand’s 1936 letter was about a version of The Fountainhead. According to the editor, that letter was actually about a proposed stage version of We The Living (but that was one of the bits I snipped from the quote). And yes, you’re right that the material in The Early Ayn Rand was published posthumously. All of it is well worth reading. The item I remembered best was the play Ideal; looking through the contents again just a minute ago, though, I think the one I liked most was Kira’s Viking. Hmmm, so it was for the role of Kira, that Rand was looking toward Hepburn. I don’t know if that casting is appropriate: I felt Kira was more inward-looking and sad compared to the seize-the-day energy of the prototypical Hepburn role, but it has been many years since I read WTL and I don’t remember Kira very well. 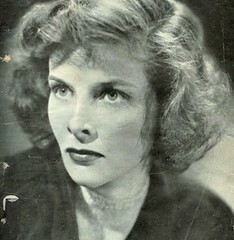 I have read that Rand was also fond of Garbo, and felt that she would have made an excellent Dominique Francon. Patricia O’Neal was good, but who knows what Garbo would have done with the role? Dagny Taggart appears, to my limited familiarity, as a vision Rand had of herself in an industrial enterprise. Is this (a) notable; (b) long since established; or (c) off the mark, so far as you’re aware (“you’re” being “anyone reading this”)? Who among today’s known actors might best portray that sort of jerkily eager, confident woman which, judging from the discussions of Vesta (with whom I was previously unfamiliar) and the character of Dagny, seems to be an archetype of which Rand was (rightfully) fond? For some reason, I suppose based mostly on her part in Contact, Jodie Foster comes to mind. She’s got the linearity of features and the energy of speech and motion. I’ve never seen Gillian Anderson in anything that would reflect this characterization, but she seems to have the visual trappings of Rand’s era. Each of you is obviously a bit less myopic in your appreciation of actors, however, so I’m curious to read your responses (if you so choose). The decision of Dagny has been (pretty much) made, and while it surprised me at first, surprises me no longer. Angelina Jolie – best known, perhaps, for her work in Tomb Raider, but equally well-known for her Randian personal life. It was recently discovered that she and Brad Pitt were trying to conceive while Brad was still married. The Hollywood stars of yesteryear knew enough to keep this kind of thing out of the tabloids, for fear that their careers would be ruined by moralists. In today’s culture of common immorality by uncommon people, Angelina knows that virtue doesn’t bring in the bucks, infamy does. I enjoyed Bringing Up Baby for its witty dialogue and ludicrous situational humor from the first time my dad showed it to me, and Roman Holiday too. I’ll have to find a copy of The Desk Set. I wonder if Ayn Rand enjoyed Marx Brothers films? Daniel: I am not sure of this, but you can be fairly sure that Dagny was Rand’s vision of what a woman (Rand herself, for a start) should be. So, you are definitely not off the mark. This is complicated for me to answer in brief and I wonder if a new post would do this justice. What I wanted to add was that, for all of Dagny’s remarkable qualities, Dagny (and Rand) were both anti-feminists. Rand would never have made a female character to rival Galt or Roark, and therein lies one of my biggest disagreements with her. She was blithely romantic, and her slavish fascination with the Galt ideal came at the expense of gender equality (in my opinion). I really don’t wish to be crucified by the Objectivists for this 😉 . Regarding the second question, Jodie Foster looks like a good choice. She was awesome in Contact. She could portray Dagny quite well. In fact, there used to be a poll for actresses who could play Dagny Taggart and, at one point, Foster was leading. Not much should be read into this, because polls dealing with Hollywood are fickle and connected only with the current celebrity climate. BlueNight: I didn’t know that Jolie had been chosen. For many years, there has been talk about Atlas being adapted for the screen, but I’ll just believe it when I see it. I wouldn’t miss it for the world. The choice might make sense to some. I don’t know what to think of it though. I would pick an actress based on her acting skills rather than basing it on the way she has lived her life. And anyway, one can glean little or nothing from the actions of celebrities; many of them live in a parallel universe, quite insulated from normal people 😉 . I am not good at this, but if I had to make a recommendation, I think Cate Blanchett could play anyone. I was equally disappointed with Dagny’s demuring, the way Rand overpowered some things with romance. I thought I was possibly missing the point, or that the protracted time I have taken to read (infrequent 10-minute stabs has led to a year of reading to get through ~550 pages) blew the romantic stuff out of proportion. Maybe that’s not so. There’s a smouldering quality to Jolie’s typical performance, whether natural or contrived, that I’m not sure would fit. But I’m far more often wrong than right about these sorts of things, so, as Polaris says, we’ll see.